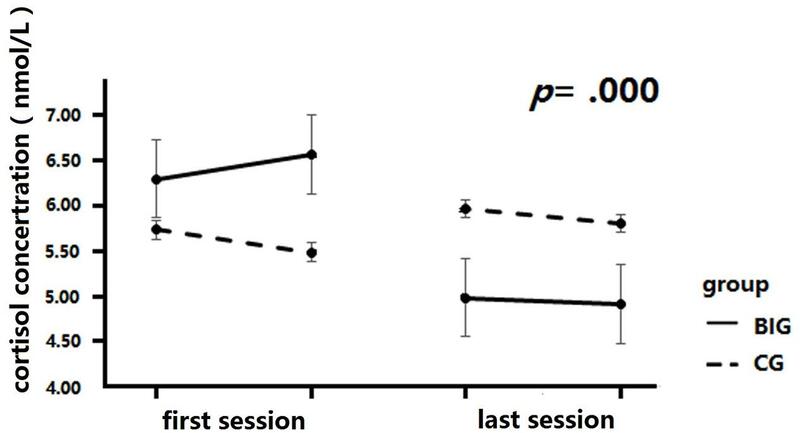 A 2 × 20 within-subject repeated measures analysis was conducted to analyze the change in respiratory rate between the resting and diaphragmatic breathing conditions across all time-points, after each of the 20 sessions, in the BIG. The within-group factors were breathing conditions (diaphragmatic vs. resting) and intervention times (20 assessments). 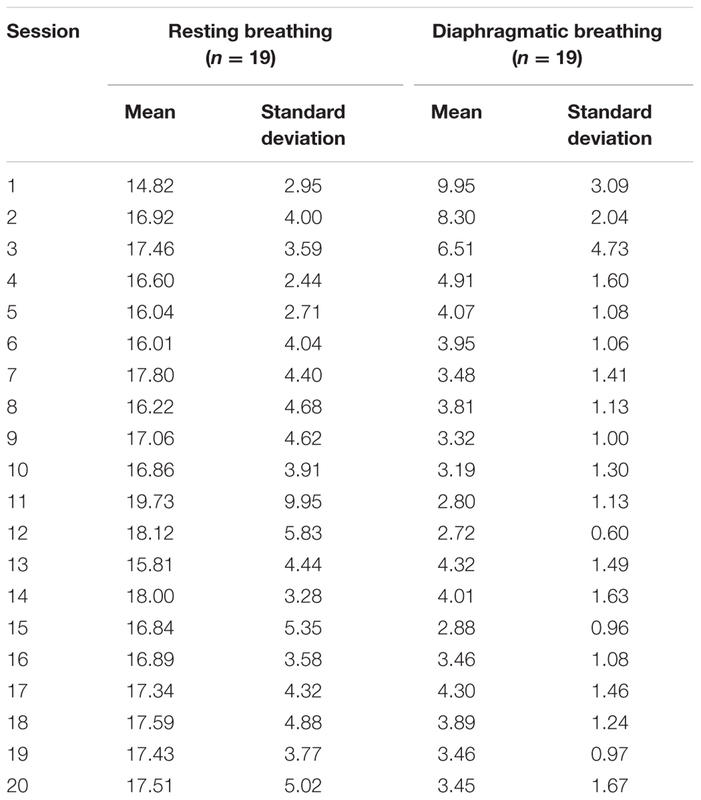 This analysis revealed a significant effect of time, F(19,133) = 2.09, p = 0.008, ηp2 = 0.23, and a significant effect of breathing condition, F(1,7) = 99.60, p < 0.000, ηp2 = 0.93. There was also a significant interaction between time and condition, F(19,133) = 5.28, p < 0.000, ηp2 = 0.43. The simple effect revealed that there were significant frequency drops (compared to time point 1) at time point 8, MD = 2.36, p = 0.027, time point 11, MD = 1.77, p = 0.018, time point 13, MD = 2.38, p = 0.019, time point 15, MD = 2.53, p = 0.006, time point 16, MD = 2.28, p = 0.014, time point 18, MD = 1.61, p = 0.033, and time point 20, MD = 2.23, p = 0.023. The simple effects on breathing shows that the respiratory frequencies in diaphragmatic breathing were significantly below that in resting breathing at every intervention time point, with the MDs ranging from 5.63 to 15.93, all ps < 0.002. These results indicated that the breathing intervention successfully reduced the breathing frequency in the diaphragmatic breathing condition in the BIG. A 2 × 2 mixed repeated measures analysis was conducted to analyze the change in the respiratory rate between the resting and diaphragmatic breathing conditions across time points and groups (see Figure 2). 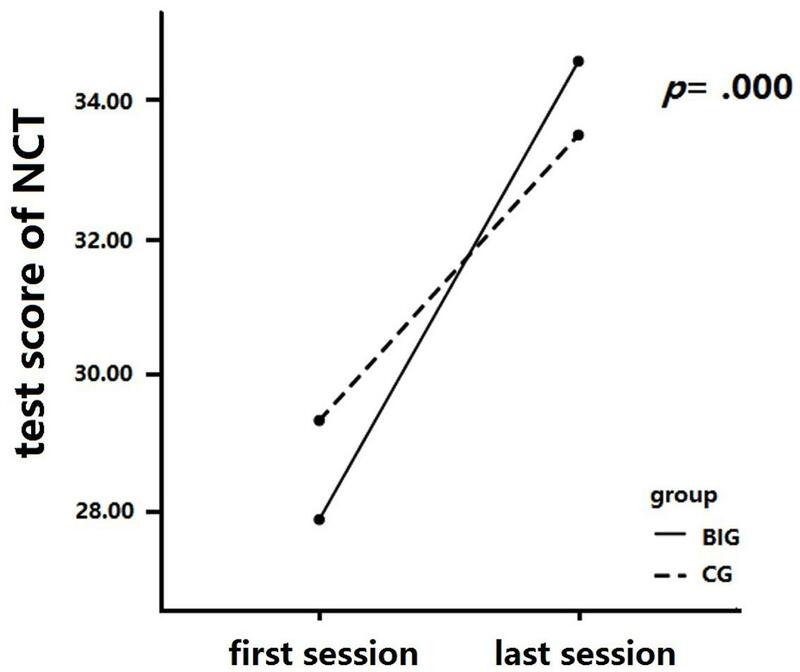 The within-group factor was the intervention session (baseline test and final line test), while the between factor was group (BIG vs. CG). The reduction of breathing frequency between diaphragmatic and resting conditions was employed as the measure. This analysis revealed a significant main effect of condition, F(1,36) = 23.36, p = 0.000, ηp2 = 0.39, and an interaction between condition and groups, F(1,36) = 7.66, p = 0.009, ηp2 = 0.175. 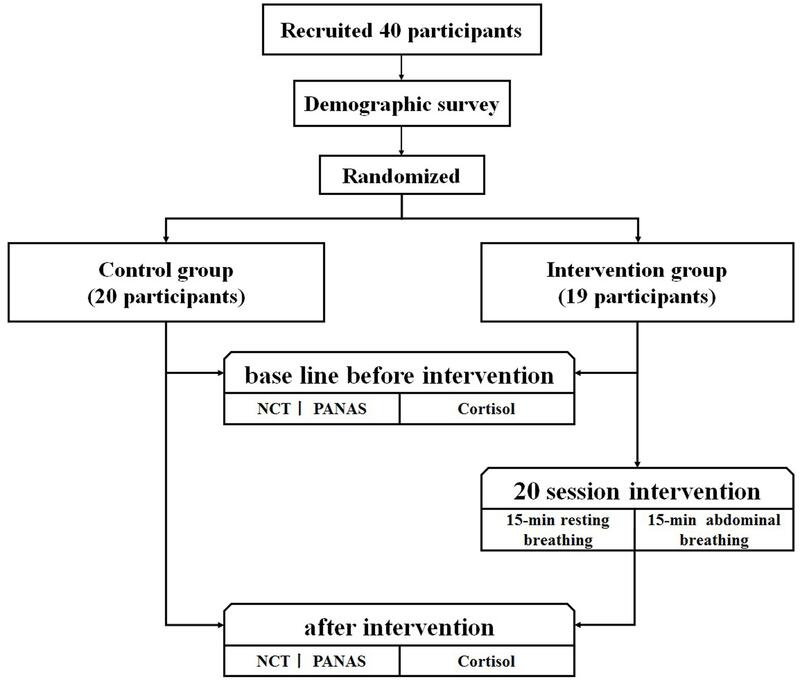 A simple effect measurement was conducted and revealed that there was no significant between-group difference during resting breathing, MD = 0.43, p = 0.861, but diaphragmatic breathing frequency was significant lower than that during resting breathing, MD = 7.12, p = 0.000. The respiration frequency in diaphragmatic breathing was significantly less than that in resting breathing in the BIG, MD = 9.19, p = 0.000, but no similar result was detected in the CG, MD = 2.50, p = 0.153. These results indicated that the diaphragmatic breathing intervention was effective in both the BIG and the CG, but a significant breathing frequency decrease was only observed in the BIG. A 2 × 2 mixed repeated measures analysis was conducted to analyze the change in NA across the intervention (see Figure 3). The between-group factor was group (BIG vs. CG), while the within-group factor was test time (baseline test vs. final test). Time and group revealed a marginally significant interaction, F(1,37) = 3.43, p = 0.07, ηp2 = 0.09. A simple effect measurement was conducted and revealed that the BIG demonstrated a significant reduction in NA score after the intervention, MD = 2.55, p = 0.02, while no similar results were detected in the CG, MD = -0.15, p = 0.88. There was no significant main effect of time, F(1,37) = 2.72, p = 0.11, ηp2 = 0.07, or of group, F(1,37) = 0.9, p = 0.34, ηp2 = 0.02. A 2 × 2 mixed repeated measures analysis was conducted to analyze the change in PA across the intervention. We measured the between-group differences (BIG vs. CG) in PA at the baseline test and final test and detected an insignificant interaction between group and test times, F(1,37) = 0.17, p = 0.68, ηp2 = 0.005, a non-significant main effect of time, F(1,37) = 0.96, p = 0.33, ηp2 = 0.03, and a non-significant main effect of group, F(1,37) = 0.29, p = 0.60, ηp2 = 0.008. 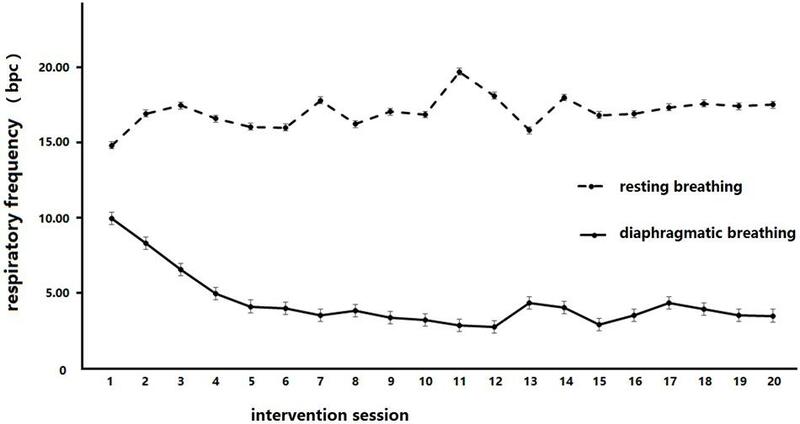 A 2 × 2 mixed repeated measures analysis was conducted to analyze the change in the NCT score across the intervention (see Figure 4). We measured between-group differences (BIG vs. CG) in the NCT score change at the baseline and final tests. The NCT result revealed a significant interaction between time and group, F(1,37) = 9.68, p = 0.004, ηp2 = 0.21. A simple effect measurement was conducted and revealed that the BIG showed a significant increase in the NCT score after the intervention, MD = 6.728, p = 0.000), and similar results were detected in the CG, MD = 4.19, p = 0.000. The main effect of time was significant, F(1,37) = 191.48, p = 0.00, ηp2 = 0.84, so was the main effect of group, F(1,37) = 0.01, p = 0.93, ηp2 = 0.00. A 2 × 4 mixed repeated measures analysis was conducted to analyze the change in salivary cortisol concentration across the intervention (see Figure 5). The between-group factor was group (BIG vs. CG), while the within-group factor was test time (test 1, test 2, test 3, and test 4). The salivary cortisol samples were collected before and after diaphragmatic breathing for both baseline and final tests. The concentration result revealed a significant interaction of time and group, F(3,111) = 9.06, p = 0.000, ηp2 = 0.20. A simple effect measurement revealed that the BIG showed a significant decrease in salivary cortisol concentration after the intervention, whereby the concentration was significantly lower in test 3 and test 4 as compared to test 1 and test 2, MD1-3 = 1.32, p = 0.003, MD1-4 = 1.39, p = 0.002, MD2,3 = 1.59, p = 0.00, MD1-3 = 1.66, p = 0.00. However, no similar result was found in the CG, p > 0.05. The main effect of time was significant, F(1,37) = 4.17, p = 0.008, ηp2 = 0.10, but there was no significant main effect of group, F(1,37) = 0.01, p = 0.92, ηp2 = 0.00. Amon, K., and Campbell, A. (2008). Biofeedback video games to teach ADHD children relaxation skills to help manage symptoms. Patoss Bull. 34–38. Available at: http://www2.fhs.usyd.edu.au/arow/biofeedback4adhd/Amon_Campbell_2008.pdf (accessed January 21, 2011).